For centuries, visual art has been a strong tool of communication as it tends to portray the mind and thinking of the artist as well as the situation of the time. Today, it is not so different because more artist have become more open minded about their works. In the first week of September in Essex England, Redbridge Museum and Central Library will be exhibiting the works of Titus Agbara in a solo show with theme Scapes from Africa. Art is life and the message it communicates in different languages and manners depending on the viewer is what makes it unique. Hearing tales about Africa can never be as enthralling to Africans resident in Africa as it will be to blacks in the Diaspora, people who have visited Africa, and those still yearning to hear about the continent that is preceded by more negative news than positive ones. The artist who says he enjoys combining traveling with art, draws his inspiration from his environment, as is reflected in the works that he will be exhibiting in the show that begins on September 3 till 8, 2007. Titus Agbara presents very colourful works that leaves little doubt in the minds of his viewers regarding his statement, as each painting has a story to tell. Born in Lagos, Agbara is a product of the famous Auchi Art School, graduating in 1999 and honoured for his outstanding performance as the best graduating student. Since then, immediately after his National Youth Service Corporation, NYSC, he decided on being a full time studio artist. Just before going to London, Titus Agbara spent a couple of months in Ghana for a residency programme. He described that experience as an avenue that helped to establish links with other artists, organisations and art professionals, establishing a mutual exchange of ideas, experimenting and trying new approaches. Nevertheless, Agbara isn’t in London just to exhibit for the fun of it and move on to other things or projects. 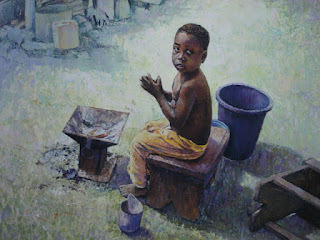 He hopes that with his paintings as a medium, he can communicate effectively and give back to Africa, what is due her. Although he has had twelve selected group exhibitions, this will be Agbara’s first solo show, after which he will be heading for South Africa, later in the year, for another solo exhibition. Hi,i have always liked paintings and hope that once i start earning enough, i will become a collector. loved your young and free articles. the last one 'i wanna be adorned' was a bit confusing. what were u hinting at?